The Ultimate Guide to Managing Clematis & Climbing Plants On The Garden Centre and In The Garden. Spend the day with us here at our new site on one of our training days to help you make the most out of merchandising, maintaining a healthy display of our plants on your plant area and expand your knowledge within our field. During the visit you will have an opportunity to view our new nursery and see how we grow and nurture our plants. Please Contact us for our next available days. Phone now on 01386 442055 or email sales@newleafplants.co.uk to book your place. Increased focus on picture. More information added to aid consumers and customer service from staff. Updated icons for easy reference of key features. Pruning code and instructions to improve after care guidance. 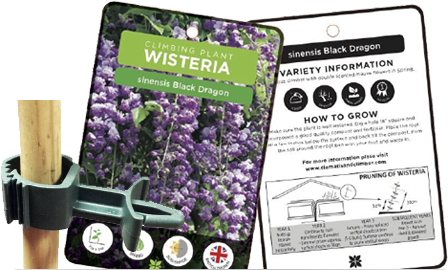 With our new plant label clips you will be able to merchandise all our plants by fronting the labels without the issue of them spinning and looking untidy. At New Leaf Plants we are always responding to the ever-changing and evolving retail market place. Our endeavour is to supply a good range of varieties as well as impulse lines and have them available at the right times for the consumer demand. To further our progress we have changed many things behind the scenes and you will see an extra column appear on our weekly looking good list with some new terminology, ie. Core, Seasonal, Choice & RE. These are plants that we suggest you have in stock and available to your customers every day of the year, proven top sellers and excellent performers both on the retail area and as garden plants. As plants come into foliage interest or bud and flower these will fit in throughout the year to bulk up the Core range or even be promoted as a standalone offer for impulse sales. These are varieties that give our range and yours credibility, often plants that never sell in volume but on their own merit perform very well in gardens. This is our brand-grown Raymond Evison range, offered in 3ltr deep blue pots, on a trellis frame, booklet style Raymond Evison coloured label and our NEW for 2017 point-of-sale material. Talk to us about how best to offer this in 2017. This year we will be exhibiting at the following shows.